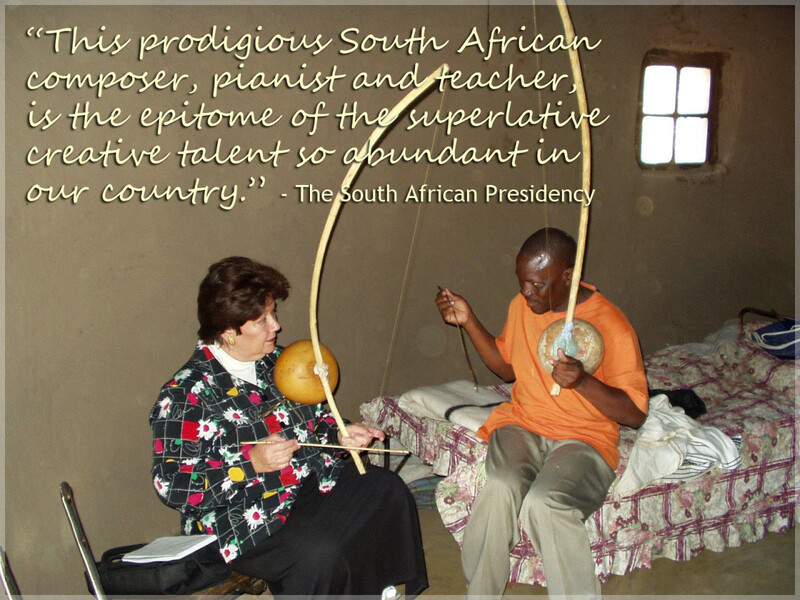 PROFESSOR JEANNE ZAIDEL-RUDOLPH's contribution to the music world is vast. Almost as vast, in fact, as the number of accolades, awards and achievements that she has so far amassed. With a compositional output that numbers more than seventy works, and that covers most musical genres from the large-scale symphony to the intimate sonata, and everything in-between, it’s not surprising that Zaidel-Rudolph is regarded as one of South Africa’s most eminent art music composers. Zaidel-Rudolph skilfully weaves her remarkable talent, immeasurable skill and varied interests to create exquisite tapestries of expression that leave both audiences and critics profoundly moved. Working within the realms of contemporary classical ‘art music’, she merges the music of the West with the indigenous pulse of Africa, thus affirming a new and unique sound world. Zaidel-Rudolph is not just a gifted composer, pianist and educator; she’s also a ubiquitous presence whose name and stature has become a celebrated brand in the contemporary art music world.